Academic Integrity is essential to academic thought and practice. Demonstrate integrity, honesty and fairness in your scholarly and workplace activities. In this badge, we will walk you through the idea of academic integrity and its significance within and beyond university. As part of this credential, we'll explore the importance of doing one's own work while also acknowledging how other people's ideas have influenced your thinking. 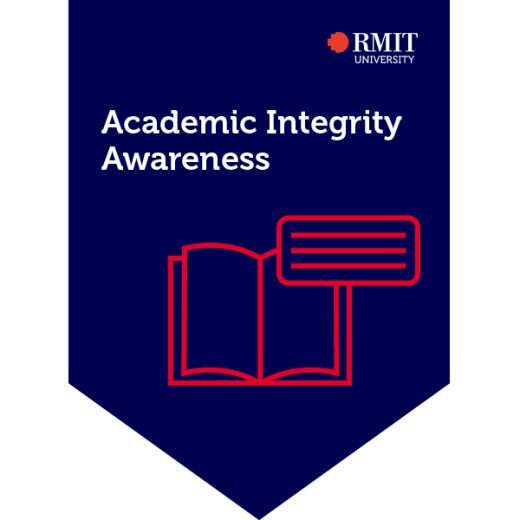 Acknowledge that the RMIT community has expectations around academic integrity. Acknowledge that honesty, fairness and integrity are values associated with academic integrity. Undertake a comprehensive assessment around the concepts of academic integrity. A pass score of 80/100 is required.